May 16 marked the first day of the 2018 legislative session, and it took less than one day for lawmakers to begin making headlines about what is likely to be the biggest environmental issue of the session – the General Assembly’s response to the 2016 discovery of GenX, an “emerging contaminant” in the water supply of tens of thousand of people in the Cape Fear region and perhaps thousands more across the state. Lawmakers in both parties, as well as Democratic Governor Roy Cooper, have been sparring over who is responsible for the GenX contamination and what to do about it for more than a year. The debate has raged in the media as well as in two special legislative sessions held earlier this year. In both sessions, GOP lawmakers in the House and Senate largely ignored Cooper’s demands but could not agree on competing GOP proposals. Their proposal, which was introduced in both the House and Senate, provides $2 million to help extend municipal water lines to homes with GenX-contaminated wells. It also provides $8 million for university researchers to conduct statewide sampling and analysis of GenX and other emerging contaminants in public water supplies. And it earmarks $1.8 million to the NC Department of Environmental Quality to purchase a mass spectrometer and hire additional staff for water quality sampling and analysis and to address its permitting backlog. The bill also makes changes to DEQ’s authority to regulate GenX. Some environmental attorneys say the changes may actually delay the Department’s ability to regulate GenX and similar compounds. This is the third GenX proposal in recent weeks. Earlier this spring, Gov. Cooper proposed a $14 million GenX response plan, which includes large funding increases in the NC Department of Environmental Quality. The Governor, and all of the state’s environmental organizations, say new funding is needed after years of steep budget cuts made by the legislature. A third plan, offered by House Democrats, would make similar investments in DEQ while also expanding the Department’s regulatory authority. So where is all this going? Right now it’s hard to tell. With the GOP in charge of the legislative and budget process, the GOP compromise bill is clearly the one to watch. Whether and how the legislature will debate the bill openly is still unclear. There is some indication that it may be placed in the budget lawmakers are working on and fast-tracked along without much, if any, public debate or even amendment. For MountainTrue, we have two top priorities for legislative response on this important issue. The first is adequate funding for state regulators to do the work of protecting our air, water and public health. 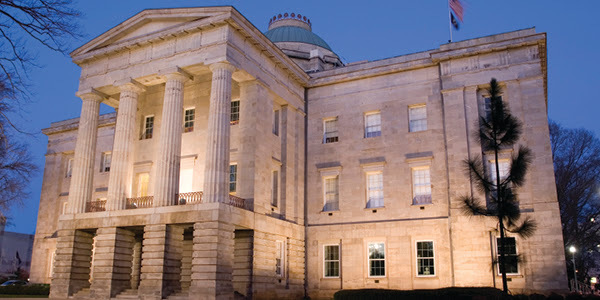 Clearly, the Governor’s proposal and the Democratic bill meet this important mark, including funding for DEQ, the NC Department of Health and Human Services’ GenX response as well as statewide testing of all drinking water supplies for emerging contaminants. While the GOP compromise bill also includes funds for statewide testing as well as new funding for the NC DHHS, it does not fund DEQ sufficiently to meet the challenge GenX and other pollutants pose to our state. We are also worried about reports concerning the unintended consequences of the bill’s changes to DEQ’s regulatory authority. Our second priority for legislative response to GenX is a simple one: we want a full and healthy debate of all of these proposals, with plenty of opportunity for the public to hear the debate and participate in it, and for the media to cover it for those who can’t come to the capital to hear it for themselves. We also want all legislators – no matter their political affiliation – to have the opportunity to comment on and offer amendments to these proposals. And we want the votes on these amendments recorded so the public knows where our representatives stand on this important issue. In short, we want the legislature to do what it is supposed to do – take up difficult, important, complicated issues, debate them in public and then make and refine proposals and pass legislation that will make all of us safer and healthier. If you agree, call your legislator today and demand that the General Assembly protect our water by investing in DEQ and by hearing all the GenX bills in a public process with amendments and recorded votes. Western North Carolina is blessed with more than 1.5 million acres of public land, including Nantahala-Pisgah National Forest, Great Smoky Mountains National Park, the Blue Ridge Parkway and several state-owned parks, forests and natural areas. These public lands support the headwaters of our rivers, beautiful mountain vistas, one of the most diverse temperate forests on the planet, and a thriving economy in tourism, crafts and recreation. During its 30-year history, WNCA (now MountainTrue) has twice prevented logging in the Asheville Watershed, first in 1990 and again in 2004. Eventually the City of Asheville placed a conservation easement over 17,356 acres of the watershed.